Outdoor leisure activities often go very well together. 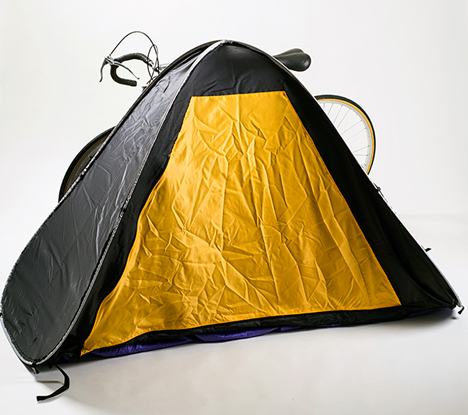 Cycling, fishing and especially camping are activities that greatly benefit from the plastic roof of a tent, a camping staple that’s not easily portable. One team of designers took notice of this and have a creative way to transport your vinyl sleeping place. 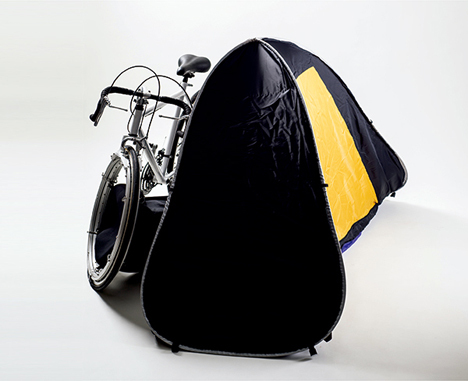 The cleverly-titled Travel Tent fits in your bicycle’s wheel well. It is attached to the wheel seamlessly to simplify access and setup. 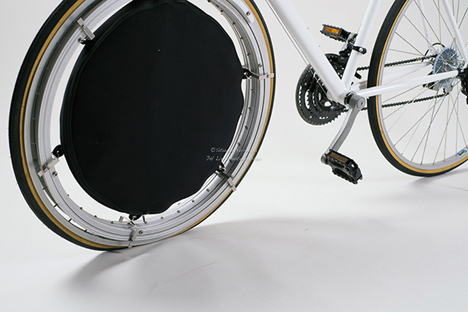 It frees up space and takes a load off the cyclist’s back. The pressing question about the Travel Tent is that of balance. It seems that putting any object that weighs more than a pound or two in the well of a bicycle wheel would greatly throw off the rider’s ability to efficiently pedal. The contents could shift or the circle could easily catch a strong side-wind. But it is, as a concept, provocative. See more in Bikes & Cycles or under Transportation. January, 2014.